This is funny because I recently re-watched the 80s Patrick Swayze vehicle Steel Dawn again and I got to thinking about whether or not someone would ever bring sword play and martial arts back to the sand dunes of the post apocalyptic wasteland. And then lo-and-behold, what do I discover but the concept reel for an upcoming project called Apocalypse Children which features all kinds of martial arts mayhem! Not much on the story yet but from what I tell it's like a reverse Waterworld where a new generation of post-nuke desert dwellers search for a mythical place called "The Vast Green..." with martial arts. Perhaps it's fitting that I would think of Steel Dawn here as the film is being developed by Colapsar Entertainment whose films rarely get higher than a 3 rating on IMDB (see Dark Harvest). 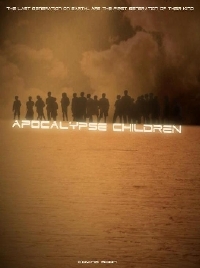 However they are incredibly fun so here's hoping we hear more from the Apocalypse Children team real soon. Concept reel after the break. All those flashy moves are a good way to get dehydrated. WOW. They shouldn't let twelve year old boys write and direct. It'll turn out like this every time. I would rather watch Steel Dawn. After the Great Fall of Mankind, In a land where men and women and wage war over water. One heroic man will have utilize Eye Liner and it's mysterious power to defeat a man because the bad script will give him no other options. So, What, is it a 'B' movie or a 'C' movie?